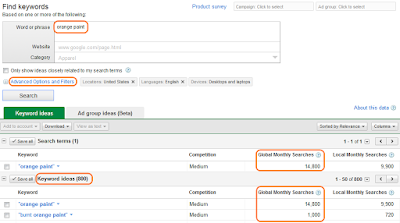 This post is about learning how to perform a keyword analysis for traffic using Google AdWord's Keyword Tool. You will need an AdWord account for this. If necessary, apply for one. Then log into AdWord and select the Tools & Analysis tab. The keyword tool is a mean to estimate how much traffic and user searches is generated according to some words carefully selected by you. Using a metaphor, such traffic can be compared to water flowing in a pipe. The end destination are web pages. The valves and the pipe connections are the key influential words you have selected. They influence the debit and the type of user flow delivered to those web pages. Performing a keyword analysis is about identifying and estimating the quality and the debit of user flow (traffic) to web pages containing those keywords. It is not about implementing a keyword strategy. This comes after the analysis. The product is this analysis is a set of traffic generating keywords. As a website publisher, you want to make sure the user traffic you receive matches your website content. If you are discussing jam recipes, car sellers will not be interested. It is even more important if you plan to put advertising on your pages. As an advertiser, you want to make sure your ads are displayed to users interested in your products or services. Therefore, you need to be positioned on proper web pages made available by publishers willing to accept advertising. From a publisher's perspective, even though the keyword tool is primarily developed for publishers planning to put ads on their web pages, it can also be used by those who don't plan to put ads on their pages. For example, if you need users to register to your website to access a service, you have the same goal as an advertiser willing to attract relevant traffic to its ads. Google AdWord (or any other ad network) acts as facilitator for advertisers willing to find locations for their ad inventory. Advertisers specify the keywords they have selected for their ads and AdWord is in charge of displaying these on suitable web page made available by publishers. Google AdSense (or any other ad network) acts as facilitator for publishers searching for advertisements for their web page inventory. They make sure their pages are properly identifiable with keywords. AdSense is then responsible for displaying the best suitable ads from advertisers to these pages. Of course, all this happens for a fee that advertisers pay to Google for publishing ads. A percentage of that fee is paid to the publisher by Google. The difference is a commission Google keeps for its matching (facilitator) role. An advertiser and an publisher could talk directly to each other, but they would have to organize the connection between ads and web pages themselves, which has a cost in time and resources. From an advertiser's perspective, you want the maximum number of user to click on your ad per ad display (or impression). This is called the CTR for click through rate. It is measured as a percentage. The higher the better for the advertiser. One way to reward the publisher is to pay a commission per ad click. This is called PPC or (CPC) for pay per click (or cost per click). In this case, it is also in the publisher's interest to maximize the CTR to maximize its commission. If Google does not match ads and pages correctly, the advertiser will be disappointed by the results of its campaign and Google will loose their future ad inventory. If this happens, then it does not have anything to offer to publishers, which will be then disappointed too and reduce their web page inventory offer to Google. Hence, it is also in Google's interest to maximize the CTR. The publisher may not be satisfied with being paid only when there is an ad click. On the other side, the advertiser may not be interested in paying for each click and will prefer to pay per impressions. The price to pay is then called CPM (or CPI) for cost per mille (or cost per impression). CPM is a cost per thousand impressions (or ads display on publisher's web pages). In this case, it is also in everyone's interest to maximize the CTR. This explains why advertisers are ready to pay more for higher CTR and why it is in the publisher's interest to match its content to proper keywords. Cheating or failing will only reduce the number of clicking users and therefore, commission. Now, some advertisers only want to pay when there is a real sell (or an action), eventually after a user has clicked on an ad. This is called CPA (or PPA) for cost per action (or pay per action). They are ready to pay a much higher commission when this happens. In this case, it is also in everyone's interest to maximize CTR, since if there is no click, there is no possibility for subsequent actions and sales. But CTR is not the only efficiency factor to be taken into account, volume (or traffic) is also as important. From a PPC perspective, everyone remains happy to see a high CTR (the higher the traffic), since advertisers get more customers and publishers get more commission. From a CPM perspective, advertisers will be interested in the quality of the traffic. If it does not match their keywords, CTR will plummet and they don't want that (low bang for the buck). So they need a mean to control this. From a CPA perspective, the publisher is interested in the quality of the traffic, because it wants users to click on the ad in order to trigger a possible sell (or action) behind this. So they need a mean to control this too. Back to the keyword tool screen. On the left column, there is a Match Type box. It controls the connection between keywords and the users' queries. There are three types of "valves". Broad means that if keywords appear at least once in a user search request, it counts as traffic. This means more traffic in general and more flow to web pages, but not necessarily of quality. If the keywords are 'Victorian Furniture', the 'Victorian wood furniture' search will count as traffic as well as 'furniture'. If you are an advertiser for Victorian era furniture, you will not be interested in all users querying about 'furniture'. It can be a low bang for the buck situation. Exact means the keywords must match the user query exactly, in the same order (not more, not less) to be considered as traffic. The advertiser for Victorian furniture will be interested in this option, because it is obvious that the user shows interested when typing 'Victorian furniture'. It is a high bang for the buck situation. However, such option will miss 'Victorian wood furniture' which is interesting traffic too. Phrase means that if keywords appears in that order in a phrase, it counts as traffic. If a user types 'Victorian furniture book', the advertiser will get this traffic, but he won't get 'Victorian wood furniture' traffic. He will also get 'Victorian furniture reparation' traffic as well as 'Victorian furniture destruction' too. A publisher will mostly be interested in phrase traffic, unless he develops a niche website about selling and buying Victorian furniture. In this case, the exact option will be more appropriate to evaluate traffic. After selecting the match type (broad, exact or phrase), type in a word or phrase such as orange paint for example. Google AdWords displays results for orange paint for example: around 14000 monthly searches globally. Publisher should use this tool iteratively, to search for new keywords, earlier suggestions, or using synonyms. Each valuation combination should be written down with potential traffic. This collection of keywords can then be used in web pages to capture corresponding traffic. There is another tool for advertisers called the traffic estimator. 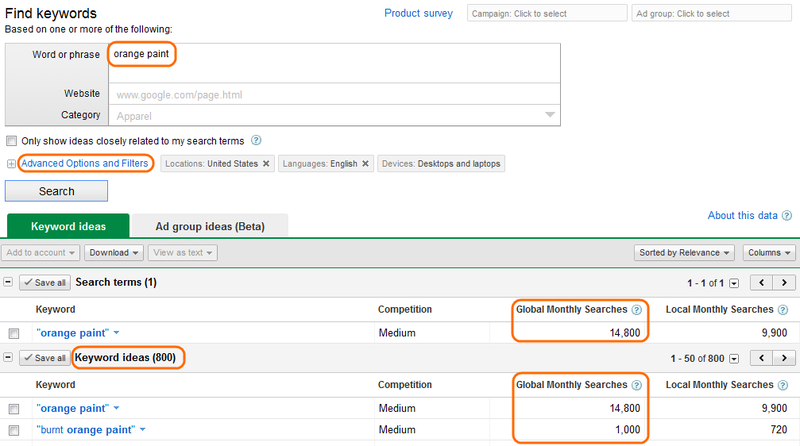 For a given keyword set and given budget, it provides an estimation of daily clicks, impression, CTC and average CPC. We will not cover this here, but it is easy to use and well documented. Performing a keyword traffic analysis is pretty easy and only requires understanding a couple of simple principles. It is a huge traffic differentiator between websites implementing a proper keyword strategy and those who don't.